ICQ - this is one of the oldest Internet messengers in history. Despite the fact that the peak of its popularity, apparently, is behind us, its history - is an example of the incredible success. For example, it suffices to say, that the total base of registrations for this program is over 400 min. unique users. Now the market is already full, but the rest, who then appeared, They were already "after", come on already passed her road. QIP, Mail Agent, Miranda and others were somewhat more progressive, comfortable, had the best financial support and advertising campaign: with their appearance "ICQ" had to press and lose a significant number of users, but it does not mean, that she "gave up". conversely, ICQ is actively developing between versions, gaining missing features, correcting flaws, taking into account the wishes of its users. Despite its venerable age by the standards of the software in 17 years old, it really can not be called outdated. What is ICQ? Today this program, It has a modern arsenal of opportunities for full Internet communication. It is not just a simple text chat with the ability to send files, or banal voice or video. import contacts from a "Mail Agent" and automatic synchronization between different versions of the software when plugged into any of them. What is ICQ? This is a small client program (its size is about 40 MB). He quickly downloaded and installed on your computer in two minutes. This is an opportunity to log in without registration, using a mobile phone number. Such a process is a little longer, than the classic (on ICQ UIN), but it is often more convenient, and even runs without problems. More ICQ - is tolerance for poor quality Internet connection. have enough speed for voice calls only 64 Kbit / s, and at the same time you can still, eg, transfer files. What is ICQ? This is not just another "instant messenger", is a cult program, give joy to communicate many of their fans. Perhaps, she won the greatest popularity at us, in Russia. 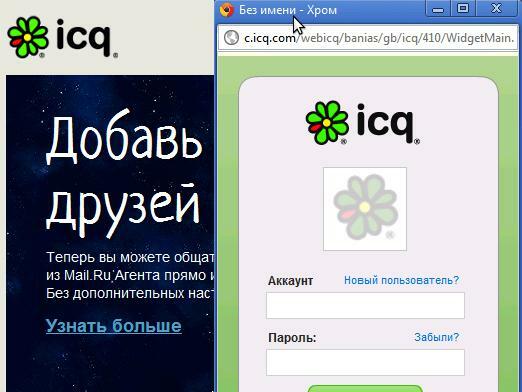 In the early 2000s, its very name has become a proper name - "ICQ". expressions: "Do you have ICQ?», "Come in ICQ! "And the like, firmly joined the colloquial usage of Internet users at the time and remain so there is still. Lots of fun and you!